We've already done part of our Christmas -- opening presents with my parents and my brother's family on Saturday. 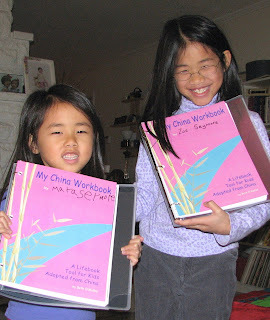 One of the gifts I got for Zoe and Maya was each a copy of Beth O'Malley's My China Workbook: A Lifebook Tool for Kids Adopted From China. It was an instant hit, and they wanted to work on them this morning. 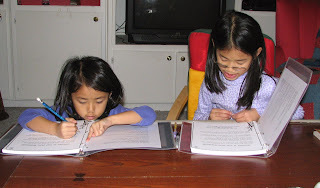 (I'm such a mean mom that I hadn't let them bring any of their newly-acquired gifts into the house until they picked up the family room, and wanting to work on the workbooks was finally the motivation they needed to clean up!) I cannot recommend this workbook enough -- the girls LOVED working in it! I'm especially thrilled that it was something Maya wanted to do. She hasn't been as verbal as Zoe in working through what she knows and what she wants to know about her adoption, but this book was great for her level (age 5) as well as Zoe's level (age 8). Zoe read Maya the text, and Maya did some of the writing with me spelling the words for her, and I did some of the writing, taking dictation from her. Th book starts with "The Workbook Promise," including a promise not to eat messy pizza while reading the book, which tickled the girls. In the first box after that we put a current picture, and then the next page is an "All About Me" page asking for favorite colors, food, friends, etc. I especially like Zoe's answer to the "what I want to be when I grow up" question -- a lawyer ballerina. Oh, yes, I know tons of lawyer ballerinas! 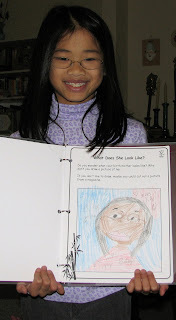 The next box is to draw their baby pictures -- interestingly, neither drew themselves as wee babes, but instead drew gotcha-day pictures that included me and Mimi. tummy. That person is your birthmother. She was pregnant with you for 9 months before you came into the world. That means you ate the same food she ate. You could even hear the same sounds. It could be that some of your favorite foods started before you were even born. What are your favorite foods? There are blanks for listing favorite foods, and a box to draw "your favorite birthday cake." I think that be girls loaded the list with Chinese foods on purpose, though their actual favorites are mostly Chinese! 1. Since you were born in China and are Chinese, we know that your birth mother didn't have red or blonde curly hair, right? 2. Bet she didn't have blue eyes either. O.K., so we can figure out some parts of her looks such as brown eyes and black/brown straight hair. You got those from your biological family. 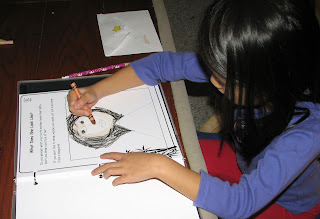 So here's Maya drawing a picture of what she thinks her birth mother looks like. The girls quite solemnly looked at themselves in a mirror before drawing. 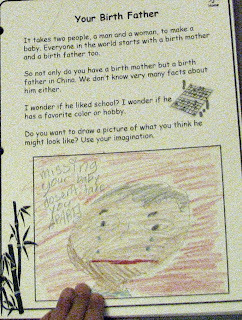 In Zoe's picture of her birth father (he has glasses too! ), he's crying blue tears, and the legend above his head says, "Missing your baby doesn't take you apart." I don't know, the tears suggest that it does. . . .
Oh, the book also has a page for coming up with names to call your birth mother, suggesting that you can pick a Chinese name or an English name you'd like to use. You'll love this, Mei-Ling -- Maya put "Mei-Ling" on the list of things to possibly call her birth mom! And I really don't know where she got that, where she's heard that name! Anyway, there's lots more in the book to work through, but it looks like it will be a VERY positive experience for both girls. I can't say it fervently enough -- YOU MUST GET THIS BOOK FOR YOUR CHILD! Although I am still stuck in the long line waiting to adopt from China(LID May 24,2006), I am going to get this book. I've been following your blogs since you all were in China and am enjoying learning from you all. "You'll love this, Mei-Ling -- Maya put "Mei-Ling" on the list of things to possibly call her birth mom!" I wasn't originally going to comment, but after seeing that tidbit, I went, "Hey! That's so cute!" LOL! OK, I've never seen a Chinese person with blue or green eyes, but I've heard of a few -- green eyes are a mutation of brown, so do occur, even among Asians. Blue? Maybe not! Or at least not without some help from the British during the Opium Wars! Mostly I was thinking of a little girl in this area who is Chinese and has the lightest brown/blonde-streaked hair I've ever seen on someone Asian (who hasn't bleached his/her hair!). Ohhhh...so THIS is the post you were telling me about. I must have logged on Sun or Monday instead of Tuesday. I'll have to ask Syd tomorrow what she thought of these books - they sound great! Great book. I will look into it for Emily when she is a little older. She is only three now. Speaking of PBS . . .
Three Stories: Russia, Ukraine, U.S.
Triggers for Thoughts of Birth Parents? 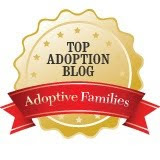 Do you really want to be an adoptive parent? A fellow traveler lost and found! Share YOUR adoption talks, please! Adopted: The Movie Now Available!